Under Canada's Chemical Management Plan, chemical substances are monitored and surveyed at municipal wastewater treatment plants. Municipal wastewater is recognized as an important pathway for harmful chemical substances to enter the environment. Therefore, in 2009, the Government of Canada’s Chemicals Management Plan (CMP) was expanded to include monitoring and surveying chemical substances in municipal wastewater treatment plants. 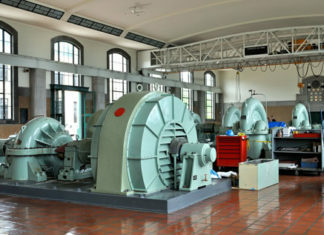 Under the CMP, the wastewater monitoring program generates data on levels of chemical substances entering wastewater treatment plants (WWTPs), the fate of these substances through the liquid and solids treatment processes of typical treatment systems used in Canada at warm and cold process temperatures, and levels of these substances being discharged in effluents and those that remain in solids residuals. 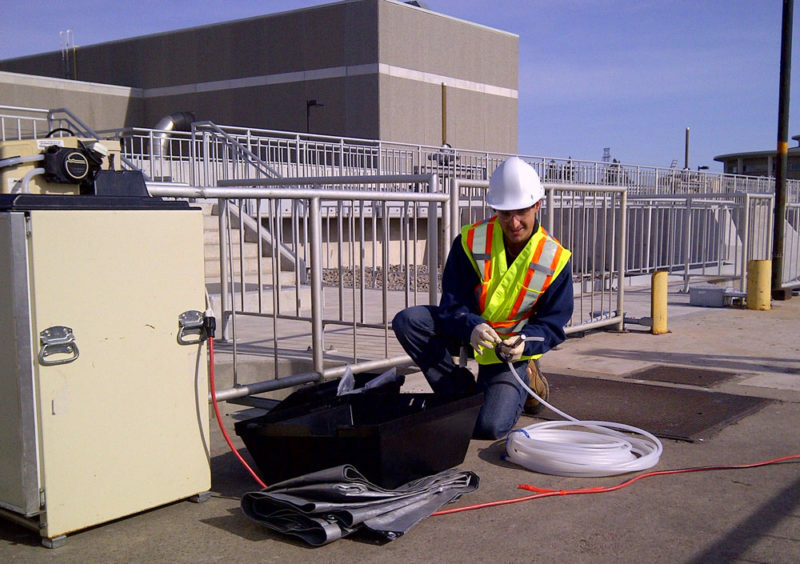 Thanks to the voluntary participation of WWTPs across Canada, the wastewater monitoring program has generated datasets on many substances. Sampling locations on a general schematic of a secondary activated sludge wastewater treatment plant with anaerobic digestion. 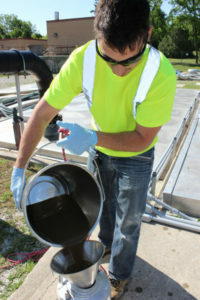 The sampling points for the wastewater monitoring program provide information on levels of substances in raw influent, primary effluent after physical settling of solids, and final effluent after biological treatment and any other treatments such as phosphorus removal, filtration, and disinfection. Sampling also includes primary sludge (PS), waste biological sludge (WBS), and treated biosolids, to determine which substances partition to solids and their fate during the solids treatment process. Raw influent, primary effluent, and final effluent samples were collected as 24-hour composites from all mechanical WWTPs and lagoons where possible. Primary sludge, waste biological sludge, treated biosolids, and lagoon effluent samples were collected as grabs. Each WWTP was sampled for three consecutive days during warm and cold seasons. Limited removal capacity by primary treatment and trickling filter treatment, and moderate removals (mean 30%) from activated sludge, biological aerated filter (BAF), and biological nutrient removal (BNR) processes. Parent compounds were removed more effectively than metabolites, and a few compounds showed strong sorption to solids. Mixed removal capacity by a membrane bioreactor plant. Final effluent contained some pharmaceuticals at concentrations >500 ng/L, while others accumulated in sludge. Some substances showed >90% removal from wastewater, while some were not removed at all. Mixed removal capacity for 115 PPCPs in five wastewater treatment types. Some compounds were removed by biodegradation, some by sorption to solids, and some remained in effluents. Removals higher than 80% were observed at temperatures above 13°C, hydraulic retention time (HRT) longer than 15 hours, and solids retention time (SRT) longer than six days. Removals were correlated with COD removal and degree of nitrification. Flame retardant (FR) residues have been measured in many organisms, human tissue, serum, and milk, and some FRs have been linked to toxic effects. The polybrominated diphenyl ether (PBDE) family of FRs was heavily used in foams and household plastics; however, because of their persistent, bioaccumulative, and toxic characteristics, their use was phased out from 2004 to 2013. PBDEs, along with four other brominated flame retardants (BFRs) that could become replacements in industry, were one of the first substance groups included in the wastewater monitoring program. PBDEs and BFRs were detected in all samples at levels ranging up to 1000 ng/L in influent and 260 ng/L in effluent, and up to 6000 ng/g in treated biosolids. They were >90% removed in all wastewater treatment processes except chemically-assisted primary treatment where removal was 70%. Removal from water occurred through partitioning to solids, not through biodegradation, and was not dependent on temperature. Optimal conditions for removal from water were >2000 mg/L mixed liquor suspended solids (MLSS), >nine days SRT, and >10 hours HRT. Levels of BFRs in biosolids increased due to destruction of volatile solids during anaerobic digestion, but decreased due to dilution during alkaline treatment. Bisphenol A (BPA) is used in polymer manufacture for protective coatings on electrical and electronics equipment, and as a liner and coating in food and beverage containers. BPA is a xenoestrogen that can disrupt the endocrine system and its use in polycarbonate baby bottles has been prohibited in Canada. BPA was monitored in the same treatment systems as the PBDEs discussed above. It was always detected in influents, sludge and biosolids. It tended to be removed during biological treatment processes with BAF, membrane bioreactor, and BNR systems showing the best removal. Chemically-assisted primary treatment showed minimal removal. Better removal was observed at higher temperatures in aerated lagoons, secondary treatment, and BNR treatment. Greater than 80% removal of BPA could be achieved with HRT 13 hours, SRT 7 days, and MLSS 1600 mg/L at warm temperatures, while HRT 13 hours, SRT 17 days, and MLSS 5300 mg/L would be needed to achieve the same removal at cold temperatures. BPA was always detected in all solids. Levels in anaerobically digested biosolids were higher than those in PS, WBS, alkaline treated biosolids, and aerobically digested biosolids. Partitioning of BPA from water to solids was minimal. Biodegradation under aerobic conditions was an important removal mechanism, while no biodegradation appeared to occur under anaerobic conditions. Nonylphenol ethoxylate (NPE) surfactants have been used extensively in cleaning products, degreasers, textile processing, protective coatings, and pulp and paper processing. In 2001, NPEs were added to the List of Toxic Substances under CEPA 1999 because of their potential for endocrine-disrupting effects. In response, Environment and Climate Change Canada required a 95% reduction of NPEs in soap and cleaning products and processing aids in the textile and pulp and paper industries by the end of 2010. These source reductions were intended to reduce levels of NPEs in wastewater effluents. 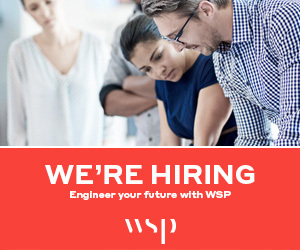 Therefore, in order to evaluate whether these actions were having the intended effect, NPEs were monitored at participating WWTPs in 2010 and 2011. NPEs were monitored in raw influent, final effluent, and treated biosolids at warm and cold temperatures. They were always detected in influents and frequently detected in effluents. Influent concentrations tended to be higher, and removal tended to be better, at warm temperatures. NPEs were removed effectively in all processes that included biological treatment (median 91%) compared to primary treatment only (median 54%). Results showed a 98% reduction in effluent concentrations of nonylphenol from secondary wastewater treatment systems compared to previous data. NPEs were always detected in treated solids. Comparison with levels reported previously indicate that NPE levels in municipal wastewater solids have decreased by up to 93%. Collecting a biosolids sample as part of Canada’s Chemical Management Plan. Volatile methylsiloxanes (VMS) are used in many consumer and industrial applications including medical devices, personal care products, defoamers, sealants, adhesives, and coatings. In 2008, Canada concluded that D4 VMS could be harmful to the environment and that wastewater effluents were an important entry pathway. D4 and other VMS were measured in influents and effluents. All samples were collected using grab methods because the silicone pump tubing in the auto-samplers caused contamination of composite samples. VMS were detected in all influents but were below detection limits in many effluents. Removal of VMS from municipal wastewater was consistently >92% regardless of treatment type, and was higher at warm temperatures. Results confirmed that sorption to solids and volatilization in the aeration tank were the main removal pathways for VMS. Perfluorinated compounds (PFCs) have very high chemical and thermal stability, as well as both hydrophobic and hydrophilic properties. They are used in many applications including textile stain and soil repellents, grease-proof food-contact paper, coatings, surfactants, and aqueous film-forming foams for fire-fighting. Many PFCs have been detected in the environment, and the two most prevalent, perfluorooctane sulfonic acid (PFOS) and perfluorooctanoic acid (PFOA), have had restrictions or prohibitions placed on their use under the Stockholm Convention on Persistent Organic Pollutants. Thirteen PFCs including PFOS and PFOA were monitored in the same treatment systems as PBDEs described above. PFOA was the predominant compound detected in effluents while PFOS was the predominant compound detected in solids. Contrary to most other substances, these PFCs were generated during the wastewater treatment process, i.e., effluent concentrations were consistently higher than influent concentrations. Higher effluent concentrations were associated with biological treatment, longer hydraulic retention times, and warmer process temperatures. This phenomenon of PFC formation is believed to be due to the breakdown of unmeasured longer-chain perfluorinated precursors. Wastewater and solids treatment processes are not designed to remove chemical substances; however, results from the Chemical Management Plan have demonstrated that some substances are removed from wastewater by degradation or volatilization and some by partitioning to solids. Some remain in effluents. Biological treatment processes tend to show better removals than physical-chemical processes, and longer retention times and higher temperatures are associated with better removals of some substances. 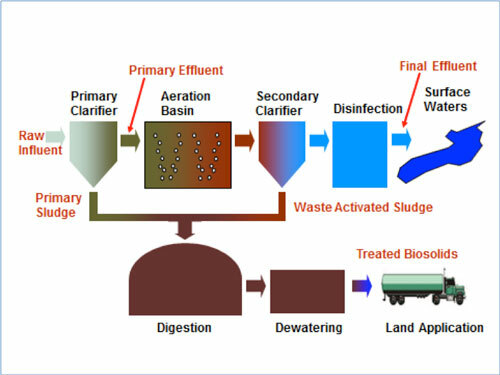 In solids treatment, some substances accumulate during anaerobic digestion, some appear to be degraded during aerobic digestion, and the alkaline treatment process causes a dilution effect. The results of this program are used to improve our understanding and prediction of the fate of chemical substances during wastewater and solids treatment, and to determine if control measures are needed to prevent these substances from entering the municipal wastewater system. 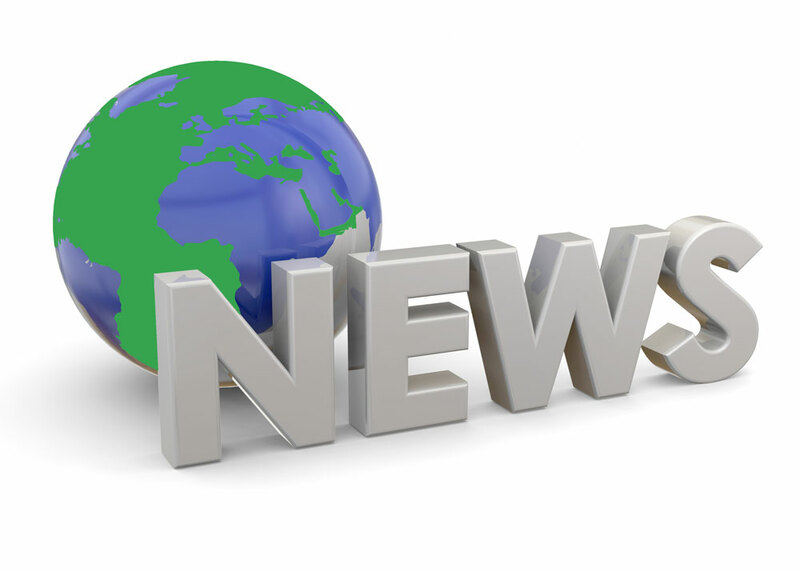 The program will continue to include long-term periodic monitoring of high priority substances, and will also investigate a variety of additional substances as needed to inform decision-making. Shirley Anne Smyth is with Environment and Climate Change Canada. References used in this article. For questions, email peter@esemag.com. Guerra et al, 2014a. J. Haz. Materials 272, 148-154. Guerra et al, 2014b. Sci. Total Environ. 473-474, 235-243. Guerra et al, 2015. J. Environ. Manage. 152, 192-200. Guerra et al, 2016a. Fate of pharmaceuticals in different wastewater treatment processes. In prep. Guerra et al, 2016b. Alkylphenols in wastewater and biosolids: occurrence and effect factors on their fate in wastewater treatment plants. In prep. Kim et al, 2013a. Water Research 47, 2213-2221. Kim et al, 2013b. Water Research 47, 6496-6505. Kim et al, 2014a. Environ. Sci. Pollut. Res. 21, 13394-13404. Kim et al, 2014b. Wat. Sci. Technol. 69, 2221-2229. Lajeunesse et al, 2012. Water Research 46, 5600-5612. Lee and Peart, 1995. Analytical Chem. 67, 1976-1980. Lee and Peart, 2002. Water Qual. Res. J. Canada 37, 681-696. Wang et al, 2013. Chemosphere 93, 766-773. Wang et al, 2015. Water Research 72, 209-217.